Pique the interest of potential clients at promotional campaigns and increase brand awareness, with the Striped Spear Mints in Large Square Window Tin. These mints leave your mouth feeling fresh, like you had just used a mouthwash. They make refreshing snacks and are perfect for keeping in dishes and candy jars around the house. The tin’s transparent lid lets the consumer see the delicious treats that await them while simultaneously displaying your logo. 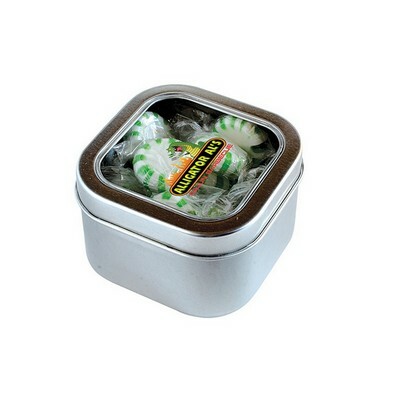 Once you have enjoyed the mints, re-use the tin for storage of other small items. They come individually wrapped to be taken on the go; thereby, elevating your brand’s popularity and success.